No matter what season we leave or what season we enter into the fact of life is that we need to smooth and soften our hair as we abuse the tresses each day by styling. What I find to be the biggest challenge in smoothing and softening hair is that some products tend to over-process hair, making it weighed down, or too soft and that leads to hair that won’t style. Our hair is such a precious asset and I can show you how to smooth and soften your hair while you take your next shower as it is effortless and you will have smooth and soft recovery! Lavishly live your tresses out loud, stop hiding under that baseball cap and learn how to smooth and soften your hair with my little tutorial. Winter leads to hair smashing and then tons of teasing and products to get the lift back, and leaving a summer of fun behind of saltwater air, sand, sun, chlorine and then fast blowouts may not have been your best choices, but thankfully I have found something that will help you smooth things over. If you want to know how to smooth and soften your hair from your days of frolicking in the sun, hitting the follicles with lemon(yeah we saw you, lol!) or swimming under the water without a swim cap(oh my!) I know the way! Get rid of the winter blahs and the summer fry, are you ready? Don’t step into that shower unless you have 180PRO Smooth & Soft in your hands or in your shower basket of tricks. The line is designed to give hair a healthy, frizz-free look and feel, with a silky-smooth, touch-ably soft, beautifully shiny finish. 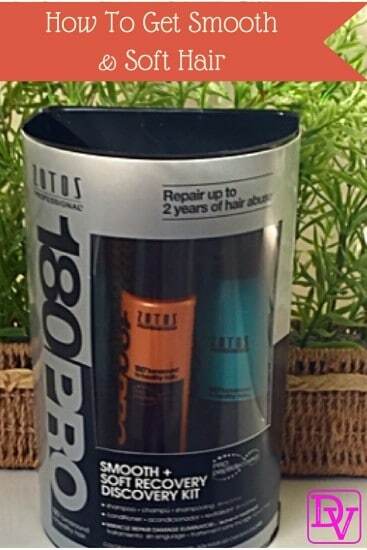 Each product features 180PRO’s signature Pro-Peptide Complex, which targets hair’s worst breaking points and actually improves its condition with each use, while helping to lock in strength and moisture. I have just tested out the trial size kit for this sensational trifecta of recovery products and I have to say it is quite impressive. The kit I will show you is available before the launch of the full size bottles, freeing it of frizz and giving it that silky feeling again! The color-safe treatment perfects and enhances waves and curls without removing them. 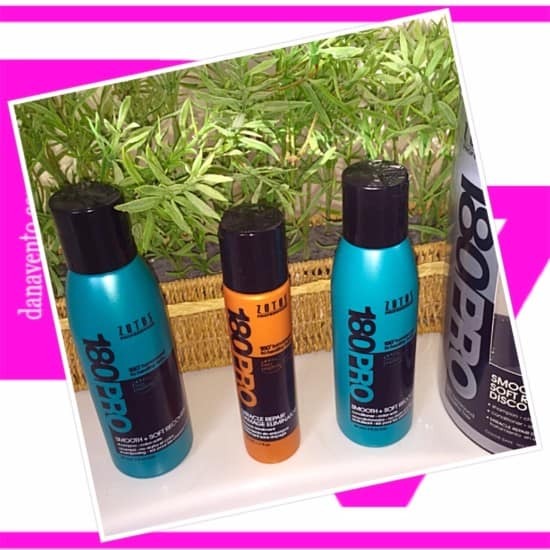 These are 3 little bottles that are just waiting to rescue that hair from up to 2 years of hair abuse(oh that sounds bad!) Are you ready to recondition and get that touch-ably soft hair again? Here’s your steps on how to smooth and soften your hair. Use this daily and you will LOVE your hair again! Squeeze the amount you need to create a lather, and scrub(lightly please, no more damage wanted!). The smell is clean and fresh, and you have just completed part one of 3, and it took you under a minute. The conditioner is ready to repair hair that has been tormented and put beyond the paces(think fun in the sun), as it will DEEPLY condition your hair. 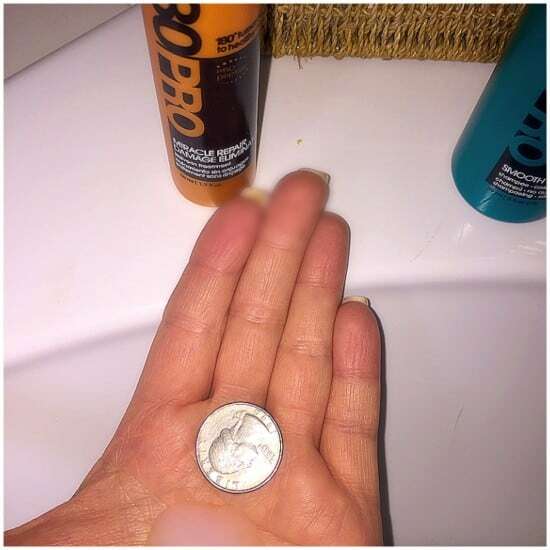 Squeeze the amount you need to cover your hair into your hand. Allow this to penetrate hair up to a minute, and then RINSE it out. Once you have exited the shower and complete the Shampoo and Conditioner part of this(a whole 2 minutes of your life have passed by-phewwww), it is time to add the step that will bring it all together: Miracle Repair Damage Eliminator. Generally, I will have my hair up in a towel, and when I take it out, I then place this into my hair as it is place in and leave-in. The purpose of this Miracle Repair is to target the weak sites of my hair and then safeguard against further damage. I like to think of this as my hair’s bodyguard(lol). Comb your hair out, place a quarter-sized amount in the palm of your right hand and do the same for your left, but don’t mash my palms together, rather, dip your fingertips into it and work this from the Crown of the head to the base, evenly distributing it. Smashing it between the palms of your hand is working it into your hands, not your hair. Again, this is LEAVE-IN Repair, just style as usual. 2~ Sometimes when I get out of the pool, I smooth some of the Miracle Repair Damage Eliminator in my hair(it’s in my bag), while it is suggested to place in clean hair, the chlorine has such a stripping and fizzing effect on my hair, that until I have time to shower up later that day, I eliminate frizz and can have comb-through hair! (it is in a ponytail(YIKES) when I am swimming). 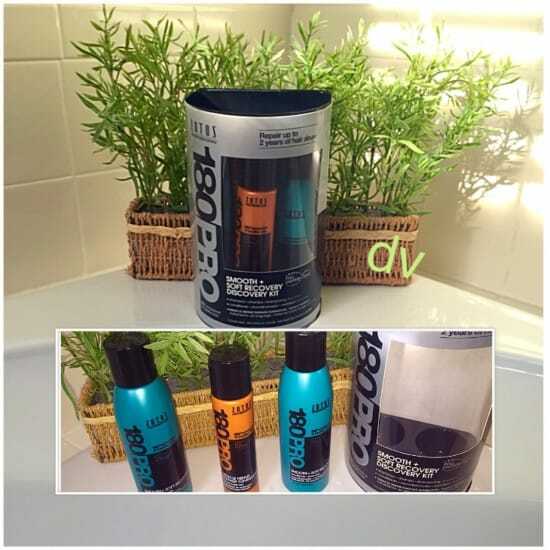 3~ You can find the 180PRO Smooth + Soft Recovery Discovery Kit at Sally Beauty and other beauty outlets. The 180PRO Smooth + Soft Recovery Discovery Kit contains many applications, depending on how much or how little you use, there are multiple shampoo, conditioning and repair just waiting for you in this kit! I love it because it does not take up a lot of space in my travel bag when I am on the go, and it is perfect for back and forth to the pool without HUGE bottles being toted, yet I am always able to make my hair so much more smooth and soft! There is a way to live without the frizz, and dry, coarse hair that we seem to have delivered to our heads after a summer time of fun. Perhaps that is why the arrival time of this Trio of products is at the end of the summer. I did mention you can find the trial size now, but shortly, the full-size products will hit the shelves. Now you know how to smooth and soften your hair so you can lavishly wear your hair outside of that ball cap again! What is your favorite part of this system?